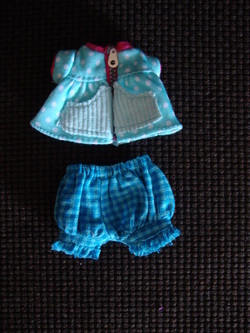 "The Lalaloopsy Littles were once rag dolls who magically came to life when their very last stitch was sewn. Now they live in a fantastical world full of surprises. With your love, their magic can go on forever." 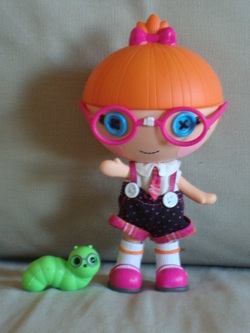 Lalaloopsy Littles first appeared in stores in the fall of 2011. They are the little sisters (and hopefully soon little brothers) of the larger dolls. A collection of clothing is also available. Matey Anchors was once a rag doll who magically came to life when his very last stitch was sewn. He's captain of the fastest paper sailboats on the sea and an expert doggy-paddler. He loves tying knots...but he usually can't untie them. 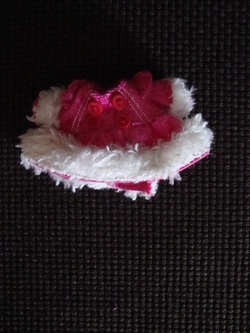 Cape Riding Hood was once a rag doll who magically came to life when her very last stitch was sewn. She loves to take long walks in the woods. Sometimes she'll find the perfect spot to toll out her blankie and have a perfect little picnic. 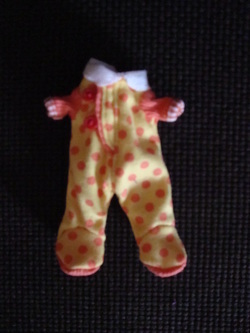 Specs Read-a-lot was once a rag doll who magically came to life when her very last stitch was sewn. She's a super-bashful, super -genius who loves counting things and collecting gold stars. Her favorite food is apples.